Time. It is the enemy of all teachers. There is only so much time, yet the expectations of what needs to be crammed into each precious day seem to expand every year. We recently ran a poll about your obstacles to blogging. We asked you to tell us what your biggest hurdles are, whether you’re a regular blogger or not. Perhaps not surprisingly, the biggest obstacle identified was time. So how do people find time to blog? It’s not an easy question to answer but we have put together ten prompts to consider to help you tackle this obstacle. 1) Why do I want to blog? If you’re dabbling with blogging or yet to get your blogging program off the ground, it can be a good idea to revisit the reasons why you want to blog. 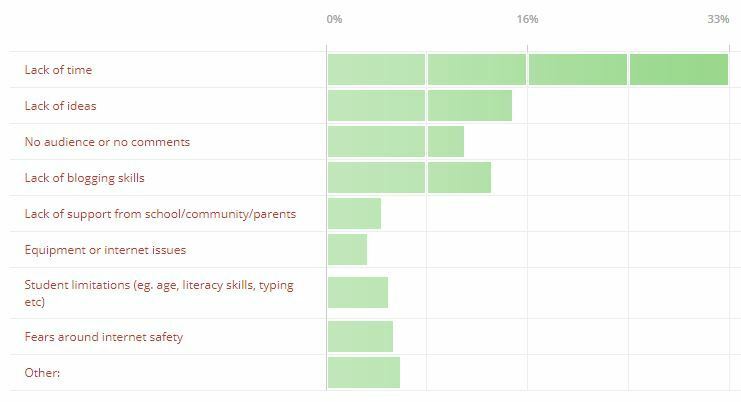 What benefits do you see blogging bringing yourself, your students, your community? We recently identified ten reasons we think all educators should blog, but revising your own motivation for blogging can powerful. Yes, blogging takes time but it’s probably going to be something you won’t regret. I’ve yet to hear anyone who has stuck with blogging suggest it’s been anything less than essential to their growth and improvement. I’ve no “data” to prove this but I’m willing to bet my golf clubs that teachers who blog are our best teachers. Perhaps blogging could take you from a great teacher to an exceptional teacher. 2) What are my priorities? Take a moment to think about what your priorities really are. We teachers are constantly told what needs to be prioritized and often feel like we are juggling a triage operation. But look at the bigger picture. Would you like to have a program in place that will really expand your horizons and open up new possibilities for your students? Make time to temporarily forget the data, the assessments, the classroom housekeeping and schedule your priority: blogging. Think about what your specific priorities are. Keep your goals short and attainable. Would you like to be posting once per week? Would you like to set up student blogs? 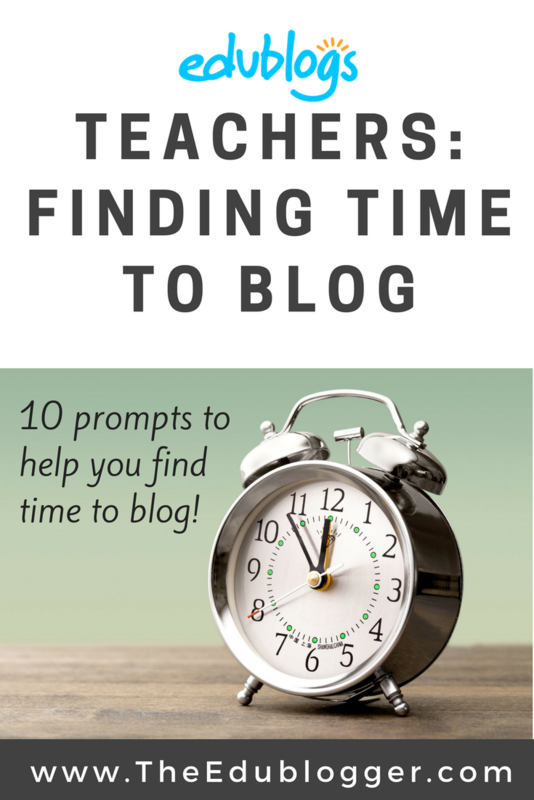 Would you like to connect with one class through blogging? “Blogging” is a broad venture: narrow it down. Where can you slot blogging into your schedule? Consider actually writing it into your diary or work program. 3) Where is my time going? Procrastination is the thief of time but so are many other routines and procedures that you might rarely evaluate once they’re set in place. Educator, Stephanie Thompson, recently wrote about decluttering pedagogy. Among other things, she questions routines that waste children’s time in the classroom. Do I give children multiple exit points for modeling? How often do children have to suffer through whole class ‘talks’ due to the actions of a few individuals? Are the children set up to start learning as they return from breaks rather than waiting for the whole class to assemble for instructions? Many teachers start the day with a routine. It might be running around the oval, silent reading, doing a weather report or looking at the news of the day. Are these routines still valuable? Could they be discarded, rescheduled or alternated? Could blogging be slotted into your morning routine? Outside of your classroom program, it is equally easy to waste time. Aren’t we all familiar with time thieves like social media, gossiping in the staffroom, watching television, clicking on random links on the internet etc? If you want to make time to blog or learn about blogging outside of teaching hours, conduct an audit and see what is robbing you of productive time. 4) What can I take away? A few minutes here and there can certainly add up. Once you have audited your time, it is time to take action. Decide if there is anything you can discard to give you more time for blogging in or out of the classroom. Sometimes analog tasks can be replaced with digital tasks. Experienced teacher, Linda Yollis, swapped a traditional pencil and paper history lesson for a blogging task. Students responded to one another in the comment section from the point-of-view of the biography figure they studied. Helen Keller was responding to Louis Braille and President Lincoln. Neil Armstrong had a conversation with astronaut Mae Jemison. Parents got involved as well. Here blogging wasn’t an add on but a swap for a more effective activity. Some tasks might seem important but really aren’t providing much value to the students. As a graduate teacher, I used to spend a lot of time making artwork as a model for student tasks. I enjoyed this but I really had to let it go to find time for other, more beneficial, activities. Likewise, I used to spend time on housekeeping tasks, like organizing shelving etc. before discovering that students could help and a lot of time could be saved. Linda Yollis, has said that she used to spend a lot of time making elaborate bulletin board displays which she cut back on to fit in time for blogging. You might spend a long time creating a parent newsletter or creating learning tasks for students. Some of these things can be replaced with blogging. It doesn’t have to be an add-on. 5) What can I add? You don’t want blogging to be an add-on as such. We don’t have time for that. However, we can sometimes change around current practices to integrate blogging into the day. I have found that blogging works best when it is integrated into your curriculum. Can you add blogging into your literacy block instead of a traditional writing or reading task? Could a maths prompt be posted on the blog and students share their findings through a comment or post? Could your inquiry or social studies topic be explored through creating a post or multimedia for the blog? Could you propose that one of your lunch yard duties be replaced with a lunchtime blogging club? This is something I did that proved to be a great way to extend our blogging program. As always, think about what would work for you. Consider the SAMR model (substitution – modification – augmentation – redefinition). Begin with substituting your traditional tasks onto a blogging platform with a view to moving on to new tasks that would be inconceivable without the technology. Want to read more about this model? Check out Silvia Tolisano’s blog. Remember, don’t try to do it all. Recycle old practices for new ones. 6) What decisions can I automate? It has been reported that teachers make between 1200-1500 decisions per day. Decision fatigue is real. Feeling overwhelmed with decisions can lead us to become impatient, reckless and unproductive. This is no state to be in when looking to take on something new. One strategy some people adopt to reduce decision fatigue is to automate some of their decisions. This is something you might already do. Perhaps you have a selection of clothing you wear to work to minimize how many decisions you need to make when dressing? Maybe you eat the same breakfast or lunch each day? Perhaps you take the same route on your walk to free your mind from making choices? Create a formula for the structure of posts. E.g. Open with a question, introduction, photo, dot points, concluding questions. You won’t sit there pondering how to open or close a post if you always write in the same format. Have a set time in the week for blogging. E.g. Every Friday at lunch time you write a summary of the week. Have set tags and categories you use to ease your thought process. Alternate between a small range of tools that you use to create multimedia to embed in your blog. I used to waste a lot of time trying to find new and different tools all the time. This was not a productive habit. Create a workflow that you’re comfortable with. Find a spot to write blog ideas (Google Doc, diary etc). Decide whether you will plan or outline a post, or just free write and then edit. Some people like to write in order (title, introduction, body, conclusion), others like to start with the body and then expand. If you attack blogging in a predictable fashion, you’re removing some of the decision making that can feel overwhelming, and free up your time. 7) How can I share the load? You don’t have to blog alone! Enlist help to delegate, support or co-create. If you have a class blog, could you have students create some of the content? Could you use a parent rep to help you with comment replies or multimedia creation? Could you run a year level blog, rather than a class blog, with a weekly roster system for posting? Do you know someone who also wants to start blogging? Could you embark on the journey together? Even if you’re not working at the same school, you could still agree to support each other. Could you ask an experienced blogger to mentor you while you get started? Blogging can feel overwhelming if you’re new to it. Collaboration can help. 8) What do I need to learn? When you begin blogging, simple tasks like writing a post, embedding a picture or replying to comments can take time. With practice, you will become more fluent and you’ll be able to complete tasks much more quickly. While it might seem counter-intuitive, investing time in learning to blog can save you time in the long run. Our Teacher Challenge series of courses might be a good place to start looking for professional development. You can work through the free learning modules at your own pace. Identify what you need to learn and prioritize your professional development to improve your fluency. 9) How can I blog when I’m not on my computer? The funny thing about becoming a blogger is you start thinking in a different way. Ideas for blog posts might come to you during the day and you might even start mapping out in your head how you could structure posts. For me, I find my ideas flow the most freely when I doing automatic tasks like running, showering, walking, cleaning etc. I find this ‘white space’ where I’m not creating or consuming to be priceless. Embrace this change in mindset and enjoy being able to blog mentally even when you’re not at your computer. Before you know it, you’ll be thinking like a blogger and you won’t be able to wait to get your fingers on your keyboard. 10) What are my distractions or other obstacles? When you set aside time to blog, make sure you are really blogging. Put your phone away, close your email, stay off social media. It’s amazing how tempting it is to multitask when you’re working on your computer. Productivity really increases when you’re not distracted. This certainly frees up time. Also, consider whether your obstacle of time is perceived or real. We all have the same amount of time and it is not like those who blog have 26 hour days, compared to the rest of the population. It is not about time, but more about priority. If people see it as important, they will make time. Do you see blogging as important? If you have time(! ), Laura Vanderkam presented a popular TED talk last year on freeing up time. It’s a very thought provoking speech from a time management expert. I particularly like her story about a flooded basement; a real ‘aha’ moment. Time is highly elastic. We cannot make more time, but time will stretch to accommodate what we choose to put into it. Will you stretch your time to accommodate blogging? How do you find time to blog? What time obstacles are you faced with? Thank you for this great post to help us all get started on “raising the bar” for blogging as teachers and with our students. I took some notes about new ideas I hadn’t considered before. One of my hurdles is figuring out how to either reserve a cart of laptops so that everyone is blogging at the same time OR using the 6 iPads + 2 iMacs in my classroom. the latter becomes a centre and the former is everyone doing this at the same time. Of course, there are advantages and disadvantages to both approaches. Although this is obviously a scheduling issue that I need to figure out for my particular situation, not being able to come up with a weekly plan that is doable and easy can sometimes get in the way of making real and positive change. Thanks for commenting! So glad you found a few new ideas here. Try to limit the internet safety one by trying to convince people to get virus scanners with web shield. It would be fun to see all teachers have blogs. I am new to blogging! Thank you for the great tips. I know that I may be pretty good at it! Hey there – good luck with blogging! Hope the tips help. Thanks! I hope you got some ideas out of it. (“How did it get so late so soon?